The Debbie Bliss Rialto Lace arrived today. I have not even had time to open the box but I will do it first thing tomorrow. I think there are also some books in the box! 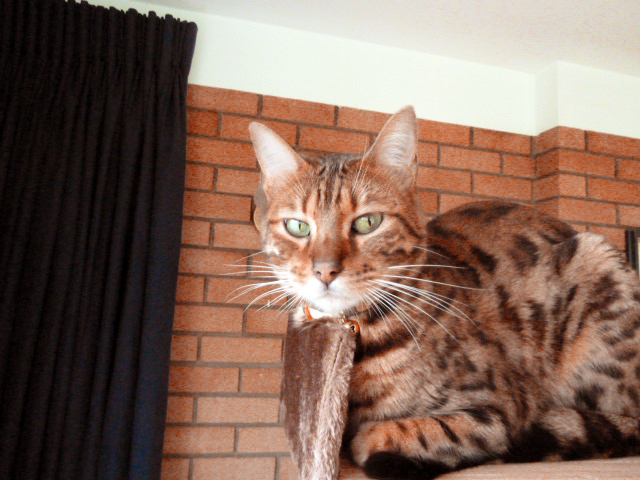 Jackson has stayed in all day by the fire – it has been very cold again. John sold a fishing rod on eBay and so I have been organising the courier and doing the documentation – it is now ready for collection tomorrow. We had to buy a piece of drain pipe to pack it in! I shall be pleased when he has sold all his surplus fishing tackle. No other news – I am going to plough on with my new shop – only about another 23,000 products to go! Sorry, sorry , sorry that I neglected you – the days seem to fly by and it is bedtime before I know it! First the contest. I omitted to add Leslie to the correct submissions for the last round – sorry! The answer was a ball of Bergere de France Soie in Bijou. Joan, Kessa, Leslie, Susan and Elena were correct – if I have missed anyone, please let me know. We will have another puzzle – a really hard one this time with small pieces – click here. Answers by Wednesday midnight please to puzzle@jannettesrareyarns.co.uk. It has been very cold here – bright sun by day but freezing at night. Jackson has a hot water bottle if he is in when we go to bed. We have to file our tax returns by the end of this month – we can do it online but it is rather difficult to do…..I expect I shall have to do John’s as well as my own. The site is coming on and I hope to launch on March 1st just before I go to Jamaica. Now I must get dinner ready – a lot of prawns to shell – not nice as they make my chilblains sting! Sorry to be behind – I am rushed off my feet plus my chilblains are so sore and typing is painful. Correct answers for the contest jigsaw were received from Linda, Susan, Joan, Christine, Elena, Kessa and Jacki. The answer was a ball of Kidsilk Stripe in Cool. We will have another jigsaw – what is this? It is quite hard but it is in my store! Here is the link to the puzzle : http://six.flash-gear.com/npuz/puz.php?c=v&id=3240416&k=88901736 Answers to puzzle@jannettesrareyarns.co.uk by midnight Sunday. The new Debbie Bliss Rialto Lace is due next week along with one new book from Debbie. John is shooting tomorrow and I am having my hair cut and going shopping. I bought two new pairs of sandals for Jamaica and still need shorts, tops, swim war and sundresses – not easy to find in the UK in January! I am starting to organise my yarns for a massive clearance – there are so many bits and pieces that I do not really want the bother of moving to my new shop. I must go and get ready for the postman – sacks to label and dockets to fill in! Just a quick in-between post to say that Rowan Magazine #51 has arrived! We went out for a meal last night to a new Mexican restaurant. I had Tostadas with tiger prawns on a bed of rice with black beans. It was very filling! John, being a conservative Englishman, had a steak! I had a Margarita which was lovely. I quite enjoyed the food but am sure it is calorie laden…..and I have to get into my swimwear!! Jackson likes the little house that is part of his new cat tree – he snoozed in it most of the day. He was out all night last night. I heard him go by chasing something in the night. He makes little cross mews when he is after something. Sure enough, there was a mouse waiting for me on the patio this morning! I am tired – today has been very busy. And I had to list more things for John on eBay. I am going to have a glass of wine and watch football whilst I knit! There were several correct entries for the first part of the contest : Joan, Kessa, Christine, Leslie, Susan, Elena, Linda and Jacki all found the 16 animals! Now please put your jigsaw puzzling hats on and go here and solve puzzle. What is it? Answers to puzzle@jannettesrareyarns.co.uk by midnight Wednesday please! 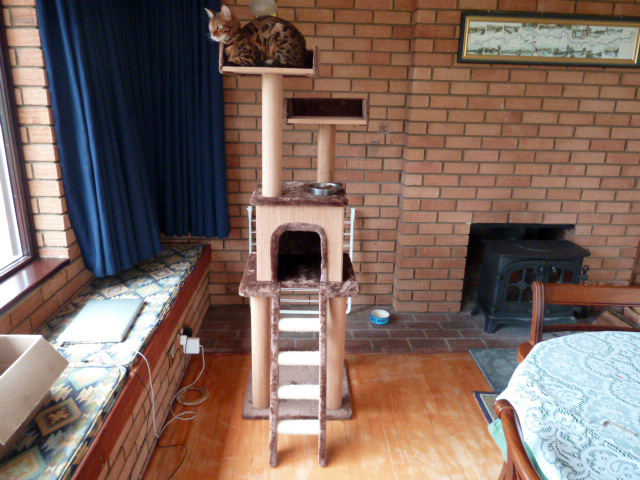 I have bought Jackson a new cat tree. We had to assemble it and it was not easy. With hindsight we realised that we should have worked top down! Anyway, it is done and Jackson likes it! No news on the yarn front. I am still considering having a giant sale……! We are going to Cambridge tomorrow to do some shopping. John needs new shirts and shorts for Jamaica and I need swimwear. I don’t feel very enthused about buying summer clothes when it is cold and dark here….it is hard to imagine that it is hot somewhere else. Now I must put some more things in my new shop – it is such slow progress but I won’t give up! I have been very busy today – John has been helping me. He is good packer but grumbles at me when I cannot find things! Slip also comes and helps by barking if any delivery men are approaching! I still have more parcels to pack and so I am going to start the new contest and then go back to my cold shed. The prize this time is a ball of Kidsilk Haze Stripe in the winner’s choice of color. The first question is a word search. Please send your answers to animals@jannettesrareyarns.co.uk by midnight Sunday. There are 16 creatures to find…….